The 9th game of the ongoing World Championship match in Sochi was drawn very shortly after Magnus Carlsen (White) had faced the superior opening preparation by Viswanathan Anand in the Berlin Defence. The peace treaty was signed after just 20 moves. Carlsen pointed out that the short draw 'wasn't a disaster', as every half-a-point brings him closer to 6.5 points required for the overall victory. Anand wasn't looking unhappy too, as he will have the white pieces twice in the three remaining encounters. Answering the question asked by the press conference host Anastasiya Karlovich, the World Champion made a guess that the 9th game might be the shortest one in the World Champioship matches in terms of the time spent by opponents over the board (just a few minites more than 1 hour). Let us remind you that the 7th game, on the contrary, was a 6.5-hours exhausting fight which has nearly set the length record; curiously enough, the opening was the same Berlin Wall. In terms of moves, the record for the W.C. matches record actually belongs to the Botvinnik - Petrosian match (Moscow 1963) where the last 2 games (21st and 22nd) had been drawn in just 10 moves each! As for the shortest decisive game, it has happened in the Anand - Gelfand match played also in Moscow two years ago: in the game 8, Gelfand had to resign as early as on move 17. 11.Ne2. The 7th game saw 11.Bf4. The text move is also far from being a novelty as it had been played by the top players many times, once even by Magnus himself. 11...b6. The aforementioned game by Carlsen (against Dmitry Jakovenko in Dortmund 2009) had went 11...Be7 (the most frequent reply) 12.Bg5 (in the later encounters, 12.Re1!? 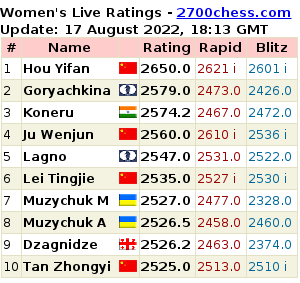 was more popular) 12...Be6 13.Nf4 Bd5 14.Bxe7 Kxe7 15.Ng5 Nd4! 16.Rad1 Ne6 17.Ngxe6 Bxe6 18.h4 a5 with equality, even though Carlsen had managed to win after all. 12...Ba6 (12...Bb7, Grischuk - Jakovenko, Russian Champ. 2012) 13.Nf4. Yet another example on the subject is 13.Ned4 Nxd4 14.Nxd4 c5 15.Nf5 Be2!? 16.Rd2 Bc4 17.Ne3 Be6 18.Nd5 Rc8! = (Kurnosov - Karjakin, Russian Champ. 2010). That's the novelty Anand had had in store for Magnus. It turns out that the purpose of 12...Ba6 was to provoke 13.Nf4 rather than develop the bishop to a side square. (The Anand's move is approved by several chess engines as well, even though one shouldn't rely on them too much while analysing the Berlin endgame). Ruslan Ponomariov hadn't been able to equalize against Leinier Dominguez (Spain 2012) after 13...Rd8 14.Bd2 Nd4 15.Nxd4 Rxd4 16.a4! Bc8 (16...g5!?) 17.a5 a6 (17...Bf5!?) 18.Be3 Rxd1+ 19.Rxd1 b5 20.Nd3!, and White won eventually. 14.e6!? This breakthrough is tempting, but perhaps Carlsen would have chosen to keep the tension had the match score been not in his favour. 'A lot of this is known, I mean this idea of 14.e6 is often met by 14...Bd6' - Anand. 15.exf7+. Apparently, Carlsen has already understood the scale of Anand's preparation, hence choosing to force the draw after some thought. 'I thought about 15.Re1 but then maybe 15...f6!? is okay for Black' - Carlsen (16.Ng6 Rg8 isn't dangerous - MG). If 15.Ng5 then both 15...fxe6 and 15...f6 are playable. 16.Ng5+. If 16.Re1 Rae8 17.Bd2 then 17...h4! = works fine; 17...c5 not that reliable due to 18.Ng5+ Kf6 19.Nxh5+ Kg6 20.g4 Nd4 21.f4!. 16...Kf6 17.Ne4+ Kf7 18.Ng5+ Kf6 19.Ne4+ Kf7 20.Ng5+ 1/2 (Annotated by GM Mikhail Golubev, translated from Russian by GM Andrey Deviatkin). 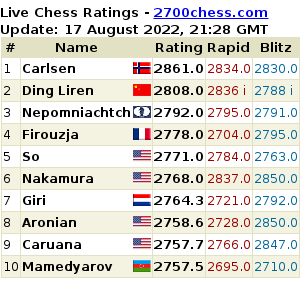 The score after 9 games is 5-4 to Carlsen. Game 10 will be played tomorrow, on November 21st.